My parents have become migratory mammals. In the summer they fly (well, actually they take a car ferry, but semantics) north to the Provence, and in the winter they journey south to the sunny climes of Malta, from whence they like to taunt me with emails about how they’re sitting outside on the quai having coffee in the 70 degree sunshine, and by the way how am I enjoying that snow in Boston. Now, even in Europe Malta is considered marginally obscure. It has achieved a modicum of notoriety recently (in the US at least) for being the place where those two Libyan pilots requested asylum (which makes a lot of sense if you look at a map of Europe and realize that Malta is basically the first place in Europe you get to when you leave Libyan air space), and where the Americans landed after they were evacuated from Tripoli by ferry. If you follow sci-fi and/or environmental blogs and are disproportionately excited by the upcoming HBO Show Game of Thrones, you might also know it is that place where they (maybe) ruined an ecosystem for the sake of atmospheric TV (I watched a new trailer the other day and did the little bounce of, ‘hey I know where that place is; I’ve been there!’). Because Malta is a fairly small island almost all the food is imported. On the one hand this means that my mother can get all kinds of things there that she can’t get in France – hoisin sauce, powdered blanc mange mix, dried gooseberries – and on the other hand, it also means that there are some extremely odd things that she just can’t get, like decent garlic in the middle of winter. This, I’ll be honest, completely baffles me. 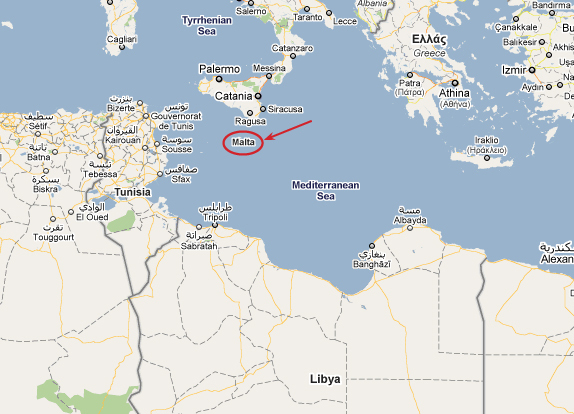 Malta is smack in the middle of the Mediterranean. It’s a culture that has been influenced by Italian, French, and Arabic culture, and you can’t get good garlic year round? How does anyone cook? Almost every recipe I makes starts with chopping garlic and onion. Mind you, Malta did spend 1814 to 1964 as a British colony (hence, I assume, the ready availability of blanc mange mix and Bird’s Eye Custard powder), so maybe that’s why nobody seems to need garlic? Since garlic is one of those things it’s a bad idea to try and preserve yourself, my mother’s solution is to buy garlic in bulk before she leaves France in October and hope she has enough to get her through the winter. The problem is that while garlic keeps reasonably well, by the end of winter she’s (a) running low and (b) it’s gone to seed a little. Recent googling suggests that you can freeze garlic either whole, or pureed in olive oil, so next year she’s going to try that. I think of her dilemma every time I make dinner because I do not think I could buy enough garlic to get me through a winter. On Sunday night alone I went through two heads of garlic – 1 full head went into the garlic butter, 8 cloves went into the tomato sauce for the chicken parmesan, and another 4 cloves were minced and sautéed for the basil-zucchini soup I made to take with me for lunch this week. It’s possible that there’s a measure of schadenfreude at play in how profligate I’ve been with my garlic usage recently – I may not have seen a 70 degree day in over six months much less sat outside in the sun with a cup of coffee, but at least I can use as much garlic as I want. 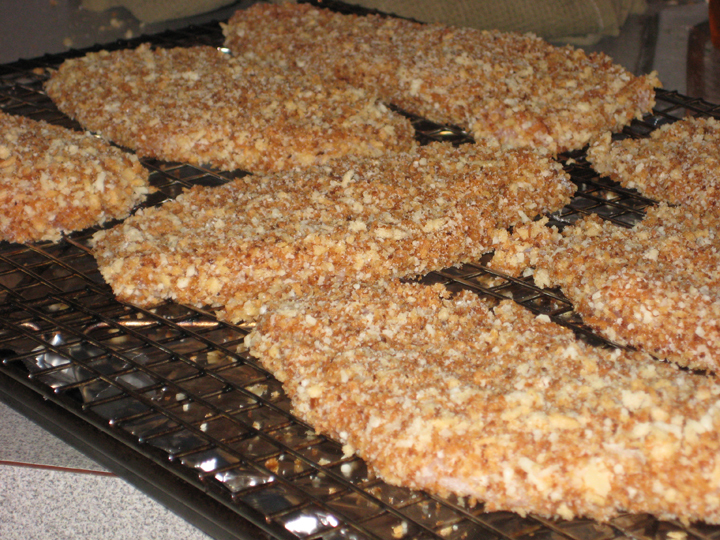 This is a variation on the baked chicken fingers I made for the Oscars this year, or put another way it’s the same technique for getting crispy chicken without going to the trouble of deep frying it. Plus, it’s healthier for you (although the butter drenched garlic bread might be cancelling out the lack of deep frying – but since I would have served it with garlic bread even if I had deep fried it, we’re still coming out ahead in the healthy department). Pulse tomatoes with juice until mostly smooth (about 10 pulses). 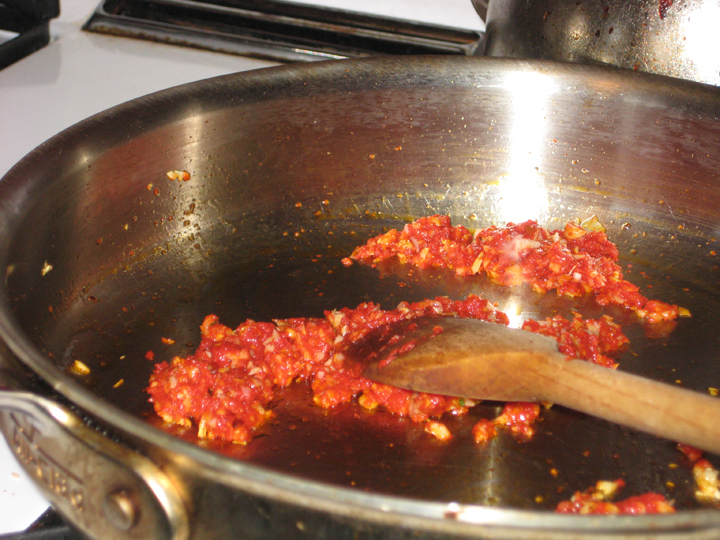 Cook garlic, tomato paste, oil and red pepper flakes over a medium heat until tomato paste begins to brown (about 2 minutes). 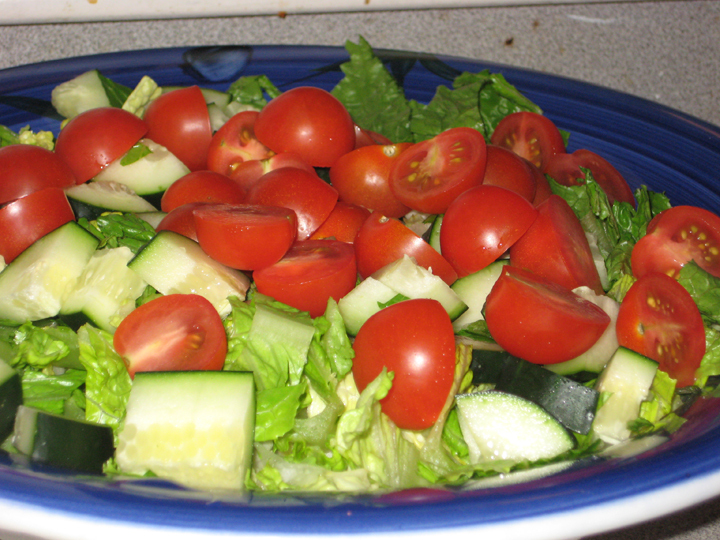 Stir in pulsed tomatoes and cook until slightly thickened (about 20 minutes). Season with salt/pepper. 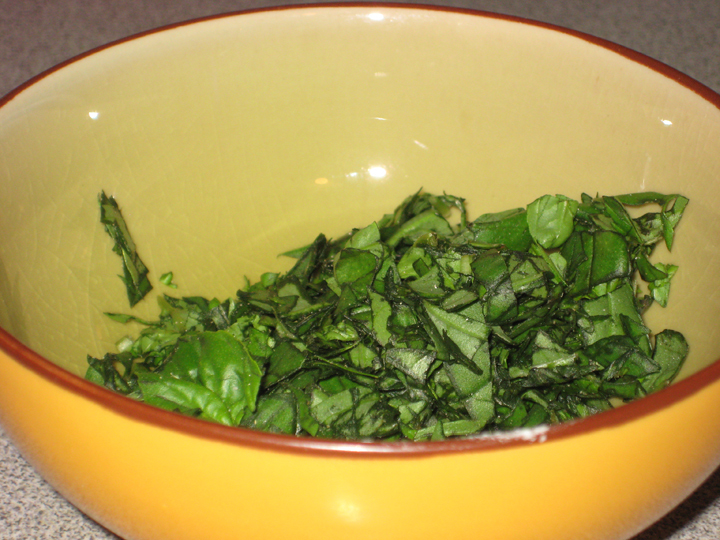 Stir in basil. Combine flour and garlic powder in a shallow dish. Toast panko in olive oil until golden – about 10-12 minutes. Transfer to shallow dish. Allow to cool. Stir in parmesan. Whisk egg whites and water together. Bread the chicken (dip in flour, then egg whites then coat with panko bread crumbs) and place on a lightly greased wire rack placed over a rimmed baking sheet. Spray lightly with vegetable oil spray. Bake the chicken for 8-12 minutes until crispy and cooked through. Remove from oven and top each piece with 2 Tbsp sauce and 2 Tbsp mozzarella. 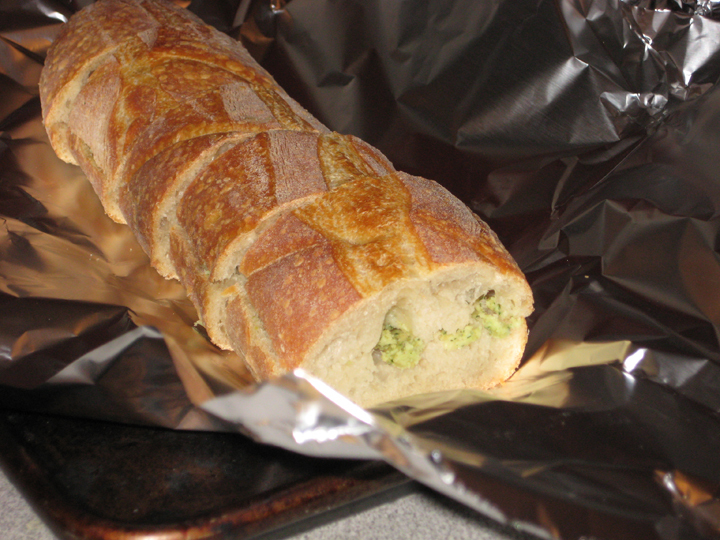 Return to oven and continue to bake until cheese is melted (3-5 minutes). 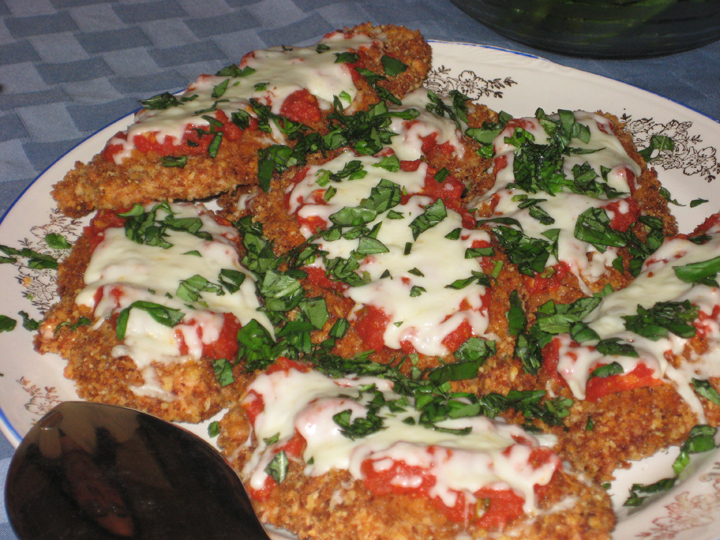 Sprinkle with basil and serve with extra sauce. Ummm, lots of garlic, butter and salt? There isn’t a recipe here y’all just enough garlic to give a nest of vampires nightmares.